Mr.Chen Sze Long, CEO of Byron Asset Management Limited, Mr.Jang Sung Won, CEO of GOLFZON and Lee Min Seop, Director of Global Business Division of GOLFZON have attended the contract signing ceremony. I look forward for the synergy to be produced between Byron Asset Management Limited’s business capacity and GOLFZON’s technological expertise. GOLFZON (CEO: Jang Sung Won) produced a tangible outcome from its efforts to enter into the Mainland China market with a golf simulator. 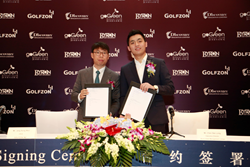 On October 15, GOLFZON entered into a sole distributorship contract for its golf simulator with Byron Asset Management Limited, a company with principal business in the Guangzhou, Guangdong Province of The People’s Republic of China. In accordance with the contract, GOLFZON will supply at least 200 golf simulators to Byron Asset Management Limited over the next two years from 2015 to 2017 and Byron Asset Management Limited will act as a sole distributor of the golf simulators in Guangdong, China. The companies will proceed with the supply and sale of golf simulators following a discussion on the detailed operating plans. With Byron Asset Management Limited, GOLFZON anticipates the expansion of its golf simulator supply business to China.